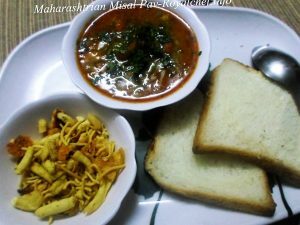 This is a step by step Recipe for making at home typical fast food stall style spicy and delicious Misal Pav. This dish is very popular in Maharashtra and there are many road side stalls and eateries which specialize in preparing this dish. 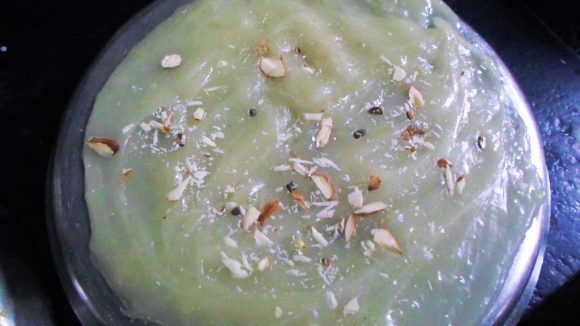 This is a traditional Maharashtrian fast food item. Wash the Matki and keep aside. Heat the Oil in the frying pan and add Rai. Jeera, Hing, Kadipatta, Garlic and Onion (1 big Onion cut in to small pieces) Then fry on the slow sim till color change to light brown. Then add the Salt, Turmeric, Red Chili powder, Garam Masala, Matki and 3 cups of water. Serve Hot. While serving add Lemon Juice and decorate with Onion, Tomatoes, Coriander and Farsan.